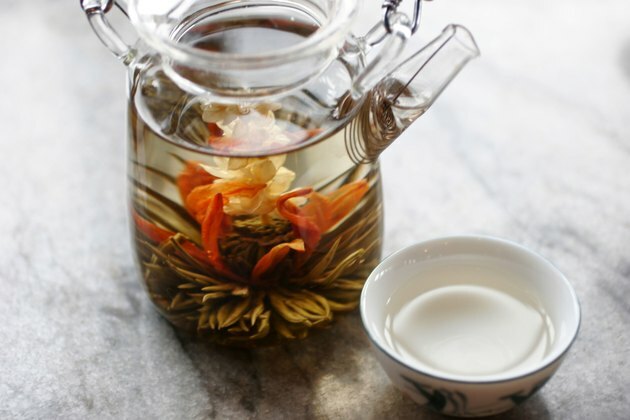 Jasmine tea has a delicate floral aroma that makes for a delightfully pleasing drink. Made with jasmine-scented green tea leaves -- jasmine blossoms are dried and then placed with the dried tea leaves so that their scent is infused -- jasmine tea has the same health benefits, including weight-loss benefits, as green tea. Green tea is naturally low in calories and is made from the leaves of the Camellia sinensis plant, the same plant that produces oolong and black teas. A 1-cup serving of green tea has only 2 calories per serving, making it a good substitute for other higher-calorie drinks, such as soda. Substituting a serving of green tea for a can of lemon-lime soda once a week for a year can help you lose over 2 pounds of body weight. Jasmine tea, like green tea, naturally contains caffeine, which has weight-loss benefits. The amount of caffeine in green tea varies from 9 to 50 milligrams per 8-ounce cup. A study published in 2005 in "Obesity Research" found that regular intake of a green tea and caffeine mixture -- with 150 milligrams of caffeine -- over a period of three months, following a four-week low-calorie diet, led to significant weight loss and fat oxidation in obese women. Even in cases where there was less caffeine in the green tea supplement, there was still a significant reduction in body weight, fat mass and waist circumference. The green tea in jasmine tea can help increase the amount of lean muscle in your body when you also add resistance training to your regimen. It can also help reduce your overall fat mass percentage. A study published in a 2013 issue of the "Journal of Medicinal Food" found that the resting metabolic rate of women was increased when they drank green tea and participated in a resistance-training exercise program. The effects were greater for those who both drank the green tea and did the exercise than for those who only exercised. Body fat, waist circumference and triglyceride levels were lower at the end of the four-week test period, and lean body mass and overall metabolic rate was higher. Researchers concluded that green tea, along with resistance training, can help with both weight maintenance and weight loss. Green and jasmine teas are considered safe, although drinking too much can lead to excessive caffeine intake. Limit your caffeine intake to 200 to 300 milligrams per day. The University of Maryland Medical Center recommends you drink between 2 and 3 cups of green tea per day to take in enough polyphenols to get the health benefits of the tea. An average cup of green tea has 50 to 150 milligrams of polyphenols. The variation depends on the brand of tea and how long you steep it. Go Ask Alice! : How Many Calories Does It Take to Lose One Pound?